1935: The Spanish Grand Prix was dominated by Mercedes who took the first three places, the win going to Rudolf Caracciola. 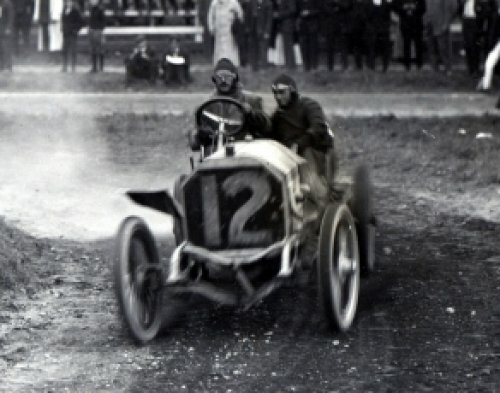 Achille Varzi, who had started on the front row in his Auto Union, was forced to retire after a stone smashed his windscreen and cut his face; he resumed after medical treatment but soon after was forced out for good with transmission problems. 1957: Richie Ginther drove a Ferrari to victory in a race at Riverside, California, USA, during the track’s first weekend of formal competition. It closed in July 1989. 1963: Jim Clark sat on pole in a rear-engined Lotus, but it was A J Foyt who won the 200-mile USAC race at Trenton, New Jersey. In a front-engined roadster, this was Foyt’s third of five consecutive wins at Trenton. 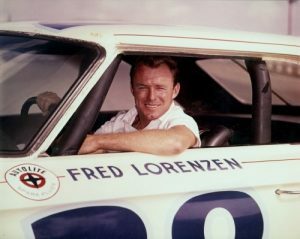 1963: Fred Lorenzen celebrated a dominant day at Martinsville Speedway, Virginia, US lapping the field to win the Old Dominion 500. Lorenzen led 421 of 500 laps in a Holman-Moody Ford, taking the lead from pole-starter Junior Johnson for the final time in the 81st lap. 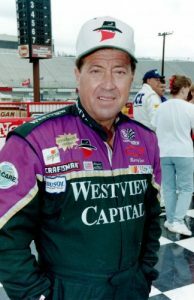 Marvin Panch finished second in the Wood Brothers Ford, one lap back, with Joe Weatherly third, three laps off the pace. 1973: Mick Hand took his 250cc Honda to a new World record of 10.5 seconds for the standing quarter mile at Elvington, Yorkshire. Paul Windross failed to break any records but did cover the flying quarter in 4.91 seconds at 183.29mph on his double-engined Triumph. On four wheels John Dodds took his famous Rolls Royce Merlin engined creation to a World record for the flying quarter at 6.695 seconds and 136.36mph. 1974: The 1974 Canadian Grand Prix was a #Formula One motor race held at Mosport Park, the fourteenth and penultimate round of the 1974 Formula One season. Niki Lauda was on course for victory, until running over debris on lap 67, causing his Ferrari to spin into barriers, having led the whole race until that point. He also set the fastest lap of the race. Jacques Laffite was also forced out due to picking up a puncture, possibly caused by the same debris on the circuit. Emerson Fittipaldi grabbed the advantage, and led for the rest of the race. It was his 12th career victory, and the last of the season for the McLaren driver. This was the first Grand Prix race for young Austrian Helmuth Koinigg, who would lose his life during the next race at Watkins Glen. 1996: Williams’ Jacques Villeneuve won the Portuguese Grand Prix from team-mate Damon Hill and Ferrari’s Michael Schumacher, having overtaken the latter on the outside of the final corner while the two were lapping the slow-moving back-marking Minardi of Giovanni Lavaggi (who at the time was described by BBC TV commentator Jonathan Palmer as “desperately slow” and “there because of his money”). This victory, Villeneuve’s fourth of the season, ensured that the Drivers’ Championship battle between him and Hill went to the final round in Japan three weeks later. 1905: The Vanderbilt American Elimination Trial was held to determine the five entries for the Vanderbilt Cup from 12 American candidates. Albert Dingley driving a Pope-Toledo 60 hp won the 113.2 mile race. 1934: Luigi Fagioli, won the Spanish Grand Prix at Lasarte in a Mercedes-Benz W25/34. 1939: P. MacArthur pulled across the finish line in Ballinascorney, Ireland, winning the last Irish hillclimb before World War II. Hillclimbing events usually took place on a public road, and they became wildly popular in Great Britain and Ireland during the early days of the automobile. Cars of all shapes and sizes would race up a hill, with drivers gunning their engines and showing off the prowess of their new motor car. Cheered on by a crowd of onlookers, the fastest car up the hill won. World War II brought an end to hillclimbs and car racing in general, as manufacturers funneled their efforts into military production. However, hill climbing returned after the war, more popular than ever. 1951: Herb Thomas took the lead from pole-starter Billy Carden in the 160th lap and leads the rest of a 200-lap main event at Charlotte Speedway, North Carolina, US becoming the first driver in NASCAR’s top series to win three races in a row. 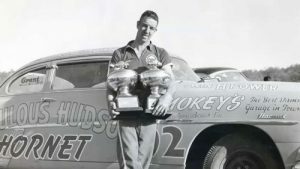 Thomas, in a Fabulous Hudson Hornet, led 105 of the 200 laps on the .75-mile dirt track, site of the the first NASCAR Strictly Stock (now Sprint Cup) race. Shorty York took second place with Donald Thomas third, both in 1950 Plymouths. 1961: Stirling Moss won the Gold Cup race at Oulton Park, England in a Ferguson-Climax P99, the final victory in a major race for a front-engined car. 1972: The famous Crystal Palace racing circuit (cover image) in London held its final meeting, ending a 45-year racing tradition. The closure had been announced a few weeks before the beginning of the 1972 season, prompted by noise complaints and safety concerns.The circuit opened in 1927 and the first race, for motorcycles, was on 21 May 1927. The circuit was 1-mile (1.6 km) long, and ran on pre-existing paths through the park, including an infield loop past the lake. The surface had tarmac-covered bends, but the straights only had hard-packed gravel.Improvements begun in December 1936 increased the circuit to 2 miles (3 km), and tarmac covered the entire length. 20 cars entered the first London Grand Prix on 17 July 1937, a race eventually won by Prince Bira in his ERA R2B Romulus at an average speed of 56.5 mph (90.9 km/h). Later that year, during the International Imperial Trophy meeting also won by Bira, the BBC broadcast the first ever televised #motor racing. With the outbreak of World War II, the park was taken over by the Ministry of Defence, and it would not be until 1953 that race meetings could take place again. The circuit had been reduced in length to 1.39 miles (2.2 km), bypassing the loop past the lake, and pressure from the local residents led to an injunction which reduced motor sport events in the park to only five days per year. 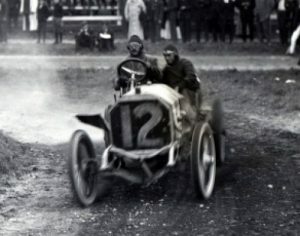 A variety of races took place, including sports cars, Formula Three, the London Trophy for Formula Two, and non-championship Formula One races. Average speeds continued to rise over the years, with the first 100 mph (161 km/h) lap average set in 1970 by that year’s Formula One world champion, Jochen Rindt. Also in 1970, the injunction limiting race days expired and racing was increased to 14 days a year. However, driver safety was coming into focus in the early seventies and it became clear that racing around a park at 100 mph (161 km/h) was not safe. Expensive improvements were undertaken, but it was not enough to save the circuit. The last International meeting was in May 1972, the final lap record going to Mike Hailwood at an average speed of 103.39 mph (166.39 km/h). The circuit’s location within Greater London made it a popular venue for both film and television settings, The Italian Job filmed on the startline at Crystal Palace for the scene showing initial testing of the Mini Cooper getaway cars and in the paddock area for the scene where a security van is “blown-up”. The Crystal Palace transmitter tower can be seen in the background of this scene. The circuit was also used in Ron Howard’s film Rush, to recreate the last corner accident between James Hunt and Dave Morgan, and for parts of the UFO (TV series) episode The Responsibility Seat. Although the circuit no longer exists (as an actual racing circuit), it can be driven virtually in the Grand Prix Legends historical motor racing computer simulation game, for which it was recreated in detail. It was later converted to several other racing simulation programs, including the popular rFactor. The circuit was used for the prologue time trial of the Tour of Britain cycle race on 9 September 2007, and is used regularly for summer road race league events, normally held on Tuesday evenings. 1975: Rene Thomas (89), winner of the 1914 #Indianapolis 500 and former holder of the land speed record, died in France. 1978: Mario Andretti drove a Penske-Cosworth to victory in the last USAC Championship Indy car race at Trenton, New Jersey, US. 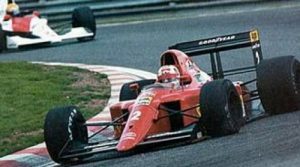 1990: British driver Nigel Mansell took his only victory of the season in his Ferrari 641, and his last for Scuderia Ferrari at Portugeuse Grand Prix. He finished over two seconds ahead of Brazilian driver and series points leader Ayrton Senna driving a McLaren MP4/5B. Mansell’s team mate French driver Alain Prost kept his fading championship hopes alive with a third placed finish. 2008: NASCAR announced a new random drug-testing policy. Also, all drivers, officials, and over-the-wall crew members would be tested in the preseason.